ISO 9001 consultants help their clients establish systems and subsequently acquire certification and accreditation to ISO 9001, the international standard for Quality Management Systems. Over the last two decades we have assisted hundreds of organisations in a wide variety of industries to achieve certification. 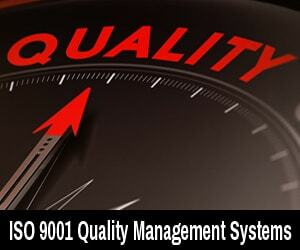 An ISO 9001 Quality Management System is a systematic and process driven approach to managing your business. It is designed to support your company in ensuring you meet the needs of your customers, whilst delivering a consistent level of quality and satisfaction. This system has been proven to make business owners and managers feel more in control and ensure everyone within the organisation is clear about what they do, whilst having the ability and authority to resolve problems quickly and effectively. Modifying existing systems to make them ‘process based’, easier to understand & therefore easier to use. RKMS establish how the business operates and develop ISO quality management systems around this, rather than providing a system that forces the business to change the way in which they operate. Our approach to ISO quality management systems and ISO certification is innovative, allowing businesses to achieve accreditation quickly and efficiently. We use ISSOSmart electronic management systems which are MS Windows based that clients have full access to and can edit as easily as editing a Word document. ISO 9001 Consultants Delivering User Friendly Systems With Real Benefits! All our consultants have years of experience of implementing and assessing quality management systems and many of them are IRCA qualified Lead Auditors. To date we have a 100% successes rate in achieving the standard in industries as diverse as Local Authorities to highways maintenance. Why not contact us to arrange a no obligation visit you to discuss your needs?